In today’s world of advanced digitally controlled protection devices, the use of fusegear in networks may seem archaic and out of place, but there is still a range of applications for this simple protection device, and fuses are used extensively in variety of applications in overhead transmission and distribution (T&D) networks. An enormous variety of fuses are available. In terms of quantity, fuses outnumber any other overcurrent protection devices. 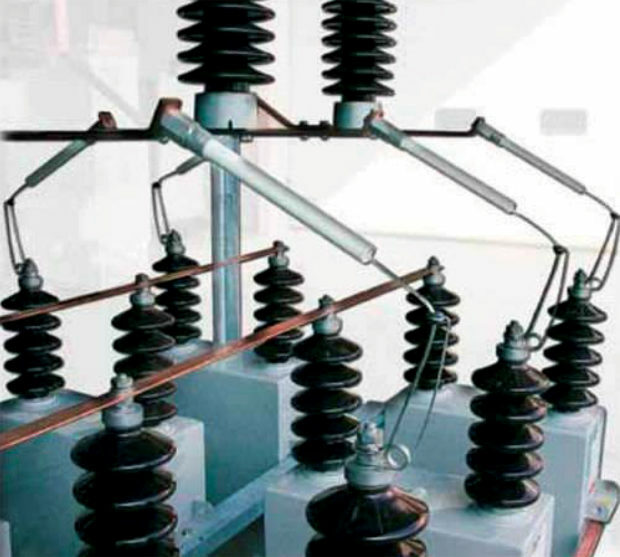 They are used for overcurrent protection of transformers, capacitors and lateral branches in distribution systems . Fig. 1: Fuses are used in wide variety of applications in T&D networks. Fuses provide a relatively cheap and simple means of protection. Fuses generally operate faster than circuit breakers, ensuring lower let-through current. Fuses do not require weatherproofing or enclosures. Fuses can provide an easy indication of operation (drop out). 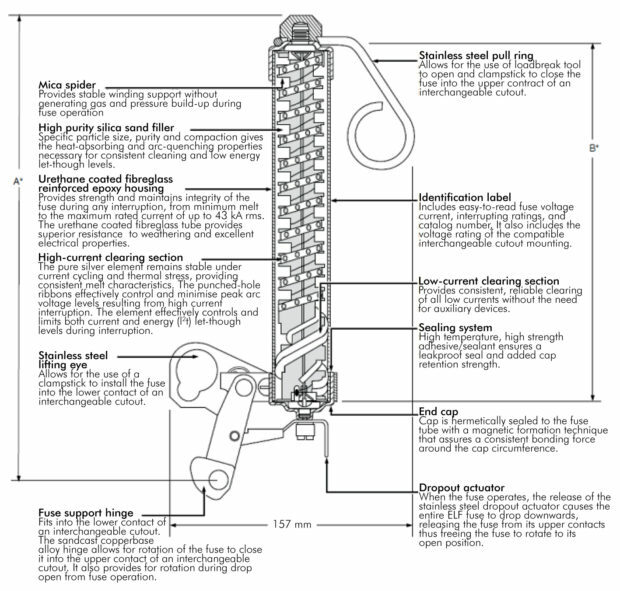 Fuses have no moving parts, they are maintenance-free and do not require periodic checking and adjustment. Fuses can be relied upon to protect a circuit for an indefinite time. The tendency to simply reset circuit breakers, and assume spurious operation, without investigating the cause, often results in closing on faults with disastrous results. (An incident at the commissioning of a local pumped water storage scheme is an example). There is less of a tendency to do this with fuse protection, and operation of a fuse is regarded as indication of a definite fault which needs investigation. Fig. 2: Asymmetrical fault current (Edison). 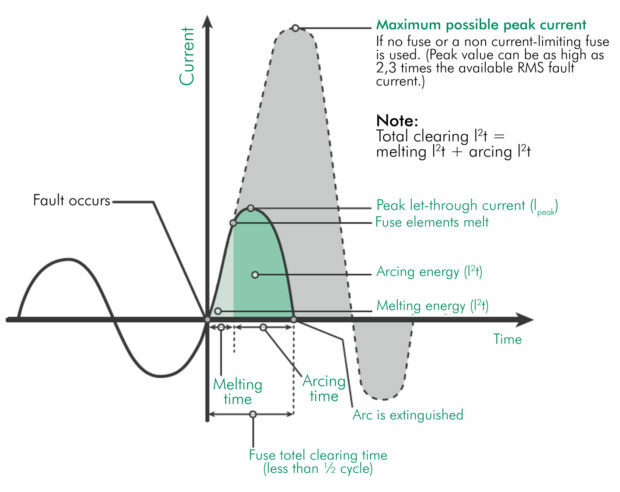 Melt or operate time: The time for the fuse to interrupt the circuit at a particular current. Let-through current: The amount of fault current allows to flow before the circuit is interrupted. This is important as excessive fault current can cause damage to equipment. Overload capability: Network fuses are generally not required to handle overloads and will only operate on real fault conditions. Some fuses are designed to operate on overloads of 2-3 times the rating current. Arc extinction capability: Operation of the fuse, i.e. the melting of the element under high current conditions, results in the formation of an arc between the remaining portions of the element or the terminals of the element. The arc is sustained by vaporised metals in the body of the fuse. To limit the let-through current, various methods have been developed to extinguish the arc before the natural extinction point. The fuse must have a maximum design voltage rating equal to or greater than the maximum normal frequency recovery voltage which will be impressed across the fuse by the system under all possible conditions. In most cases this means the maximum design voltage of the fuse must equal or exceed the system maximum line to- line voltage. The only exception to this rule occurs when fusing single-phase loads connected from line-to-neutral of a four-wire effectively grounded system. Here the fuse maximum design voltage need only exceed the system maximum line-to-neutral voltage. Fig. 3: Fuse time-current rating curves (Bussman). The rated interrupting capacity of power fuses is the root mean square (RMS) value of the symmetrical component (AC component) of the highest current which the fuse if able to successfully interrupt under any condition of asymmetry. In other words, the interrupting rating denotes the maximum symmetrical fault current permitted at the fuse location. 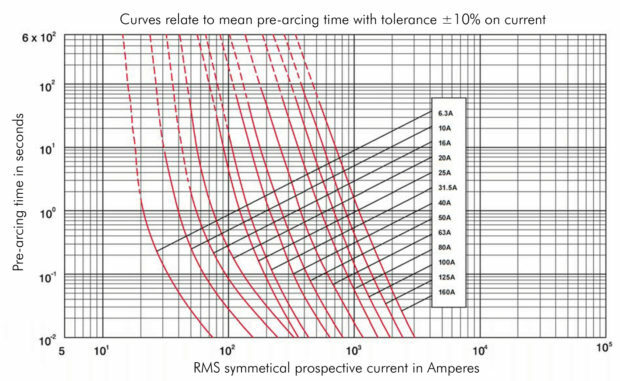 Asymmetrical currents are related to symmetrical currents by the asymmetry factor which is the ratio of the RMS value of the asymmetrical current. This includes a DC component, at some instant after fault initiation to the RMS value of the symmetrical component of current. 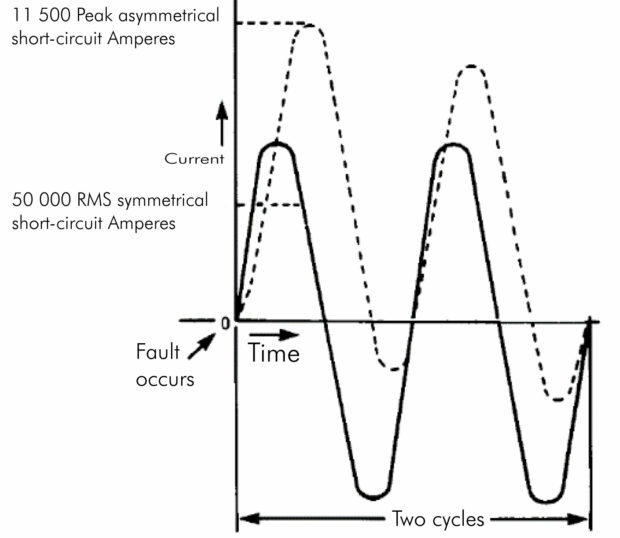 Asymmetry factors for a time corresponding to a half-cycle after fault initiation are a function of the circuit X/R ratio. Asymmetrical current is illustrated in Fig. 2. Power fuses are designed so that they can carry their rated current continuously without exceeding the temperature rises permitted by standards. Rating and operation are described in the current time curve. Typical current time curves are shown in Fig. 3. Most fuses used in networks will require a minimum melting current versus continuous current rating ratio of 2:1. Power fuses are designed to continuously carry their rated current without exceeding temperature rise restrictions. If the rated current is exceeded by a small amount, an overload situation is encountered. An overload situation is when the fuse is subjected to a current below the minimum melting current (≈ 200% of rated current) but substantially above the continuous current rating for an excessive length of time. This type of condition generates a large amount of heat and may cause damage to the fuse. This problem is less severe in fuses that employ silver elements which are, for all practical purposes, indestructable. However, caution should still be exercised when overloading the fuse as the heat generated may produce deterioration of the arc interrupting medium and charring of the fuse wall before the fuse element melts. Fig. 4: Transient recovery voltage (Nptel). When the fusible element in an expulsion fuse melts as the result of a fault, an arc is established inside the fuse. The current will continue to flow in the circuit and within the fuse until a natural current zero is reached. When the arc is extinguished at zero current, the voltage across the fuse terminals changes from the relatively low arc voltage to the steady state power frequency recovery voltage. This recovery voltage is determined by the system configuration and type of fault and/or load connections. The voltage waveform across the fuse terminals during the transition from arc voltage to power frequency recovery voltage is referred to as the transient recovery voltage. 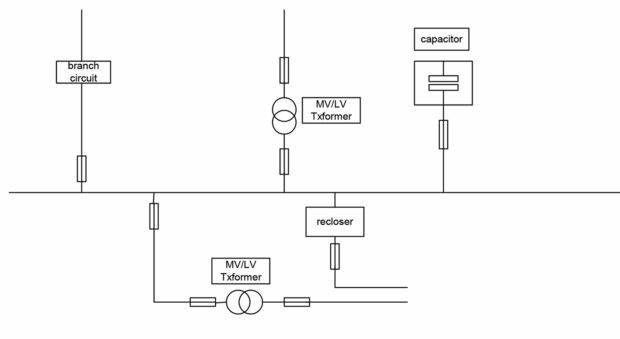 Transient recovery voltages can produce high voltage stresses across the fuse terminals. The dielectric strength between the fuse terminals must rise faster than the transient recovery voltage if a successful interruption is to occur. The impedance in the circuit determines the resonant or natural frequency of the transient recovery voltage after the arc is extinguished. This frequency of oscillation and the amplitude factor are defined as the ratio of the highest peak value of transient recovery voltage to the peak of the power frequency recovery voltage. Fig. 5: Typical expulsion fuse construction (Eaton). Fuses for T&D networks are generally of two types: expulsion fuses and current limiting fuses. With high fault currents and voltages in enclosed fuses, the development of an arc is problematic, and is solved with expulsion fuses. High fault currents can be expected in T&D networks and limiting of the maximum fault current and let-through current is a prerequisite in many cases. Expulsion fuses are commonly used in T&D networks. In this fuse the element is contained within a narrow bore tube surrounded by air. Under fault conditions the fuse element melts and an arc is struck across the break. The heat of the arc vaporises the arc extinguishing material, so arc extinction is achieved by the generation of gases within the arc chamber, creating pressure which expels the arcing debris from the chamber. These gases create increased pressure within the fuse tube acting to expel the debris from the fuse tube. The gas movement assisted by the cooling and de-ionising effect of the vaporised tube wall products extinguishes the arc. With removal of the arcing debris, the dielectric strength inside the fuse tube is re-established, enabling it to extinguish the arc at the next available current zero. The structure of a typical expulsion fuse is shown in Fig. 5 . Expulsion fuses are vented and thus have a high noise level and expel a greater amount of gas making clearance from ground an important consideration. 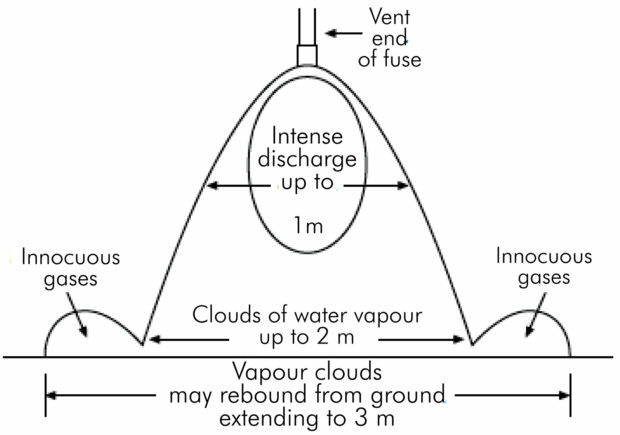 Operation of the fuse results in discharge of gases over an appreciable area of the vicinity of the fuse as shown in Fig. 6. This could be problematic when closing onto a fault. (See video in ref. ). Such fuse types are usually employed on outdoor distribution equipment and overhead line poles. Expulsion fuses are not silent in operation and additional clearances are required to avoid ionised gases causing flashover. Expulsion fuses may be single use or re-useable type. In the reusable version the case of the fuse is retained, together with the connections and release mechanism, and the cartridge containing the fuse element, arcing rod and arcing chamber are replaceable. Expulsion fuses have a rather low thermal capacity and cannot carry overloads of the same magnitude and duration as motor and transformer fuses of equal continuous currents. Suppliers suggest that fuses should be rated below the design rating to allow small overloads. Fig. 6: Discharge pattern of expulsion fuse (Eaton). The purpose of the arc extinguishing material is to create pressure within the arcing chamber, to expel arc material and thus extinguish the arc. A variety of arc extinguishing materials are used in expulsion fuses, but most rely on water as a decomposition product, to produce the pressure required to extinguish the arc. Bone fibre: This material is still in use as an arc quencher in major manufacturers. The arc heat causes decomposition into mainly water and other organic products. tri-hydrate (ATH) filler is used as the water source in the synthetic arc quenching core. The amount of filler is controlled to provide just the right amount of water for efficient interruption and extinction of the arc. The material is embedded in an epoxy matrix which has a high resistance to moisture absorption from humidity. The moisture content, and therefore the interrupting ability of this system is not affected by ambient humidity. Boric acid: A commonly used material, boric acid decomposes into water and boric acid anhydride when the arc strikes. Water produces stem at high pressure to expel arcing debris and extinguish the arc. A current-limiting fuse is a fuse that, when its fusible element is melted by a current within the fuse’s specified current limiting range, abruptly introduces a high resistance to reduce current magnitude and duration, resulting in subsequent current interruption. 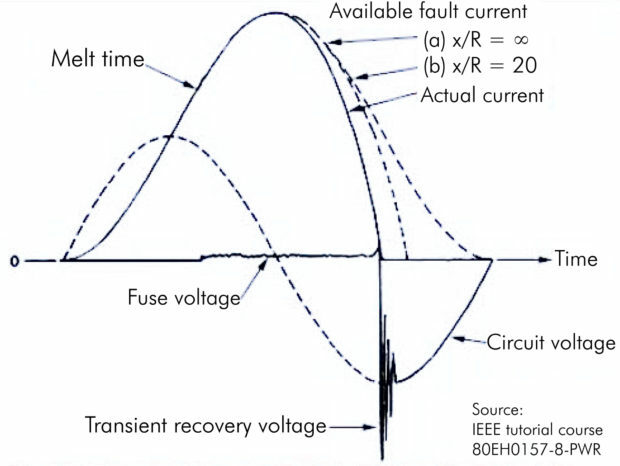 In a non current-limiting fuse the fault current continues to flow until extinguished by the cycle of the supply system. Fig. 7 compares current limiting and non-current limiting fuses. Current limiting fuses are used. Fig. 7: Current limiting network fuse operation (Littelfuse). A fast blow element which operates rapidly in response to an overload. A high resistance element used to reduce the fault current during the remainder of the fault clearing time. Operation of the fast element switches the high resistance element into the circuit, thus reducing the fault current. The high resistance element then continues with the arc extinction process. A typical current limiting fuse construction is shown in Fig. 8. 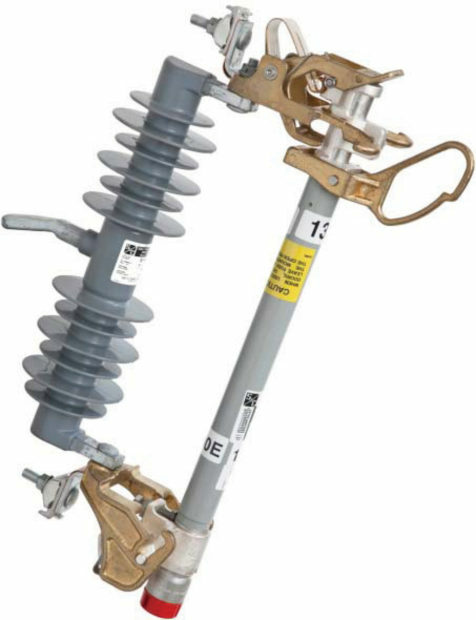 These are expulsion or current limiting fuses and are commonly used in overhead distribution networks. The fuse is held in place, at an angle to the vertical, by an upper and a lower contact, fixed to an insulated mounting, with a mechanism that allows the top contact to disengage on fuse operation, so that the fuse carrier tube falls outwards about the lower hinge. This allows isolation and avoids leakage along the tube due to buildup of arc deposits. It also makes it easy to spot fuse operation by the overhead line inspection/repair team. The fuse can be inserted from a distance using an appropriate hot-stick. The fuse can also be opened while operational to isolate the section of the line, by disconnecting the fuse from the upper contact. Fig. 9 shows an example of a typical drop fuse in its holder. The fuse is inserted and held in place by two contacts. The lower contact consists of a pivot mechanism which allows the fuse to rotate and is kept in place by a locked lever. The upper contact of the fuse is under spring pressure and pushes downwards or outwards on the fuse. Fig. 8: Typical current limiting fuse design (Eaton). Operation of the fuse triggers a release mechanism (either at the top or the bottom of the fuse) that causes the upper contact to open. The lower contact is maintained in the rotating cradle and the fuse swings downwards, rotating around the lower pivot, opening the circuit. The actual trigger or release mechanism varies from supplier to supplier, which generally means that the fuse must be compatible with the holder. Fuses are commonly used on overhead distribution systems for several reasons. They allow simple protection and disconnection of a branch or tee off the main route, and allow operation from the ground without having to come close to the live overhead wires. The also do not require weatherproofing or enclosures. Faults on distribution networks are often temporary in nature and for this purpose, reclosers are used, which operate on a fault and then reset several times before ceasing operation. Protection is provided by an in-line fuse which operates if the fault persists after the recloser ceases operation. Fuses are subject to several heating and cooling cycles before the recloser cycle stops or reclosing is successful. Correct design requires that the fuse does not reach operating temperature during the cycling, but still operates satisfactorily. Fig. 9: Drop out fuse and holder (SEC). Fuses are used on the incoming side of distribution pole transformers to disconnect the transformer from the distribution line in the case of a transformer fault. Fuses are usually of the drop out type, and may be expulsion type or current limiting. Current limiting fuses offer greater protection to transformers. Protect the source side system from an outage due to faults in or beyond the transformer in the case of an internal winding fault in the transformer, the fuse should prevent further damage to the transformer (Although the primary fuses will isolate a transformer with an internal fault from the primary system, expulsion fuses generally are not fast enough to prevent extensive damage to the transformer . Coordinate with protection on the low-voltage side of the transformer (transformer primary protection must be overload tolerant, allowing the secondary protection to clear faults occurring downstream of the secondary protection). Protect the transformer against bolted secondary faults (the fuse should operate on any bolted secondary faults, between the transformer secondary terminals and the secondary protection before the transformer is damaged. Fuses on the primary side of transformers should not operate on transformer magnetising or inrush current. The magnitude of the first loop of inrush current and the rate at which the peaks of subsequent loops decay is a function of many factors. The fuse must be able to withstand an inrush current of 12 times the load current for 0,1 s or 25 times the load current for 0,01s . Fig. 10: Bus-mounted capacitor fuses (Enerlux). The primary purpose of a capacitor fuse is to isolate a shorted capacitor before it can damage surrounding equipment or personnel. In capacitor banks it is essential to fuse each capacitor individually. This is especially important in large banks of parallel capacitors. Should one capacitor fail, the parallel capacitors will discharge into the faulted capacitor with violent results. Individual capacitor fusing eliminates this problem. Capacitor fuses are selected for their ability to provide short circuit protection and to ride through capacitor inrush current. Inrush current is affected by the closing angle, capacitance, resistance and inductance of the circuit, and varies from one application to another. Inrush lasts for less than one-quarter of a cycle and is typically less than 25 times the capacitor’s current rating. Standard expulsion fuses or bus-mounted expulsion fuses are commonly used in a drop-out or bus-mount configuration. The post Fusegear still useful in T&D networks appeared first on EE Publishers.